Novenco was using a cloud-based archiving solution to cope with the ever increasing amount of emails it needed to store. The IT department soon discovered it was prone to instabilities, end users struggled to find emails they needed and it was very expensive to maintain. 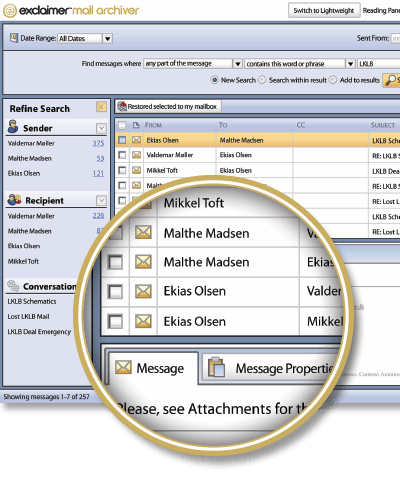 Mail Archiver was chosen due to its affordability and the way it could be scaled to meet the needs of the organization. This provided large cost savings and proved more reliable than its previous archiving solution. With more than 60 years’ experience, Novenco Group is one of the world leaders in the development and manufacturing of high-quality heating, ventilation, air-conditioning and refrigeration solutions for land and marine applications. Founded in Denmark in 1947, Novenco Group's primary goal is to offer environmentally responsible and energy-friendly solutions for the most demanding global comfort and safety requirements. In 2013, Novenco was purchased by Hi Air Korea Co. Ltd, the primary Korean provider of HVAC equipment to the Marine & Offshore industry, but continues to run as an autonomous organization. It employs over 700 people, has offices in 9 countries and is going through a process of heavy expansion into new business verticals. It is an understatement to say that an email archiver is an important investment for any organization. With the large volume of emails sent and received every day, the handling and storage of messages has become a key concern for business owners and IT professionals worldwide. Whether it be for legal purposes or to ensure efficient and cost-effective business processes are in place, an archiving system provides a secure location for email communications whenever they are needed. Novenco was well aware of this fact and the IT department were quick to adopt an archiving solution that they felt would be right for the organization. To this end, a cloud-based solution was chosen to meet the regulatory and business requirements of long-term email storage. The price of this archiver was considered to be very high, but it was hoped that it would offer long-term cost savings over time. Even with this concern, the archiver was purchased and set up relatively quickly. However, it soon became clear this initial concern had been entirely justified. Even though Novenco had invested a large amount of capital, the archiver proved to be exceptionally unreliable. Emails would get lost, it did not have a user-friendly interface and end users found searching for specific messages problematic. After nearly a year, it became increasingly difficult to justify how much Novenco was spending on something that was causing more problems than it was solving.